Appellation or Vine Aglianico del Vulture D.O.C. Vines cultivated for their red fruit on the volcanic slopes of Vulture in Basilicata were once known as Hellenico because of their Greek origins. With the passage of time the name changed to Aglianico. The Aglianico grapevine, now common in this area, yields quality grapes which produce a delicate, aromatic wine that since 1971 has been classified as D.O.C. Aglianico del Vulture. 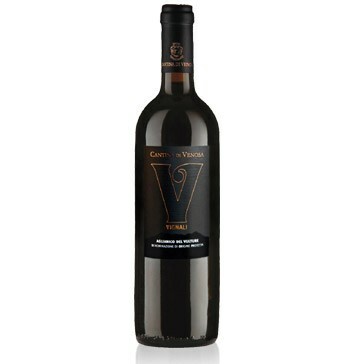 It is a wine that has been acclaimed throughout the ages. The Latin poet Orazio, born in Venosa in 65 AD, praised the "comfort, joy and confidence" it confers. Centuries later it was praised by Carlo I d'Angiò and drunk by Pope Paul III Farnese. The wine is obtained from grapes which are cultivated using the traditional Gouyot system and harvested by hand towards the end of October. Fermentation takes place under controlled temperatures, with maceration of the grapeskins. It is then refined in oak casks for 12 months. The finished product is a ruby colour, which tends to have an orangey reflection when it has been aged. Its winy yet delicate scent is vaguely reminiscent of violets and fruits of the forest. It tastes dry, cool and harmonious, and almost velvety when aged. Cantina Cooperativa Riforma Fondiaria di Venosa was formed in 1957 by a specially created public body for the reform of Puglia, Lucania and Molise. It was equipped with its own processing facilities in 1965 and again in 1985. These have special grape crushing facilities and can cope with 60'000 quintals of grapes. The cooperative is made up of about 500 members from Venosa, Ginestra, Ripacandida, Maschito and Montemilione. At the end of the day, it is the members of the cooperative who guarantee the quality of the finished product. This wine goes well with roast meat and game. It should be served at 15-17 degrees centigrade and opened at least one or two hours earlier. The best glasses are clear, transparent crystal goblets. If it is kept well, it has an average life of five to eight years. The bottles should be laid flat in a cool, dark, humid cellar.